Has anyone heard of the Sporting Giants?? It was launched five years ago and is an X Factor meets Superstars recruitment drive for handball, rowing and volleyball, three “tall sports” aka tall people are needed!! 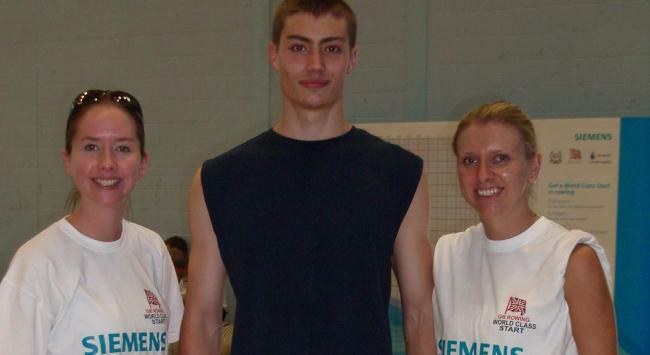 Both Men and Women aged 16-25 were asked to come forward for testing, providing they had played sport to a good level and were taller than 6’3″ for men and 5’11” for women! Nearly 4,800 people applied but that number was cut down through seven stages of assessment until 100 were added to the development programmes of the three sports. With the 2012 Olympics now less than five months away, 17 Sporting Giants have already competed internationally, winning 13 medals. Eight of the group are on track to compete in London, including two of British Rowing’s best hopes, Helen Glover and Vicky Thornley. So lets look out for the ladies and spur them on!!! That is a mega achievement that this Sports drive has actually found Olympic hopefuls!! This is much better case that X factor where the winners are usually heard of once and never again!! This entry was posted in Silly, Sports News!, Sports Profile, Uncategorized and tagged Olympics, Sports Giants. Bookmark the permalink.